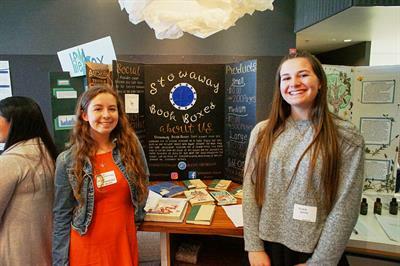 This lively convergence of Bay Area community members, business leaders, and program supporters celebrates student sustainable entrepreneurship at the Marin School of Environmental Leadership (MarinSEL). 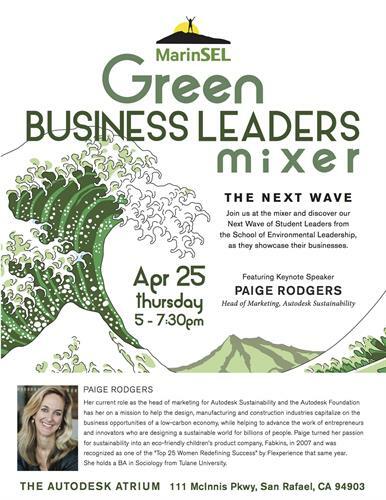 An inspiring annual event that celebrates the MarinSEL Junior class as they showcase enterprises they have created, the Green Business Leaders mixer connects local businesses and individuals around green practices, while uplifting the programming at this innovative and impactful high school program. The event offers an amazing opportunity to network with other green business professionals and student leaders. Our keynote speaker is Paige Rodgers, the head of marketing for Autodesk Sustainability and the Autodesk Foundation. Appetizers and drinks will be served. Want to meet stellar students? 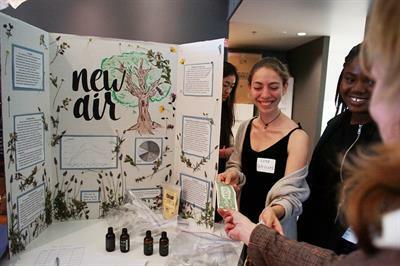 During our welcome showcase, students will be showing off results of their LEAD projects, prototypes from their Sustainable Enterprise project and Environmental Engineering course, and symposium posters reflecting on a year-long Senior Internship Seminar. Us too! We want to get-to-know our community and business leaders. You are true builders of our program. Come mix and mingle with an array of Bay Area professionals.